AddressLabels for Mac has been written such that it is possible to transfer iPhone/iPad lists to your Mac, and vice-versa. This is performed using the Dropbox backup/restore feature of the app, similar to the way this feature is often used to transfer lists between iPhone and iPad. Please note: when transferring lists from one device to another, the existing data is overwritten. Moving a list from your iPhone/iPad to the Mac app is simple. 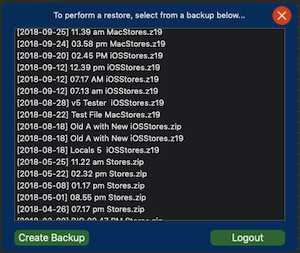 First follow the steps in Dropbox Backup/Restore to display the backup table. In the example shown, you will see that some of the backups have a .zip extension, whilst others have .z19 extension. The .zip files will have been created by the iOS CardLists app. The .z19 files will have been created by either the updated iOS app (now called AddressLabels) or by the mac AddressLabels. The former will have iOSStores in the name. The latter will have MacStores in the title. AddressLabels can cope with either format. So, simply select a file, and click the Restore button. You will get a warning about how proceeding will overwrite any existing lists. If you are ok with that – hit OK and restore your list. 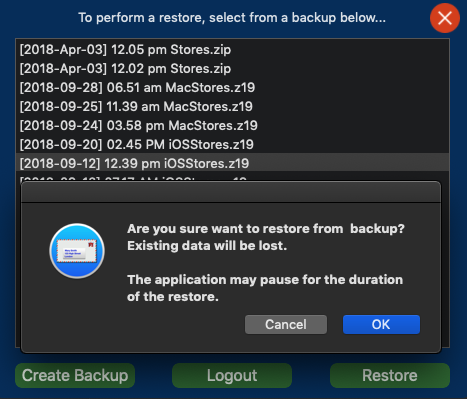 Although AddressLabels for Mac can restore from any of the backups, whether created by the iOS AddressLabels V5 or later, or the older version of the iOS app (CardLists v4.6 or earlier), if you want to create a backup using the Mac, and restore to your iPhone or iPad, then the iPhone or iPad must be running AddressLabels v5 or later. The older version of iOS app will not “see” the files with .z19 extension so they will not appear in the table. Note that if your list uses names from Contacts, and the list was originally created on another device e.g. an iPad, then for the list to look correct (e.g. have correct addresses), you will need to be using the same Contacts on both devices.